A researcher at the University of Arizona College of Medicine – Phoenix is using stem cells to study the interaction between environmental exposure, such as radiation and cigarette smoking, and cardiovascular disease. 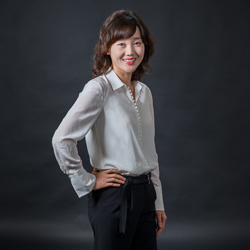 Won Hee Lee, PhD, is an assistant professor in the Department of Basic Medical Sciences with expertise in radiation, cardiovascular disease and stem cell biology. Her research focuses on the use of human-induced pluripotent stem cells to study the interplay between environmental exposures — such as radiation and electronic cigarette vaping and cigarette smoking — and the development of cardiovascular diseases. “I hope to use my basic science and translational research expertise to show that patient-specific stem cells can have a significant impact on improving cardiovascular diseases, including elucidating disease mechanisms, implementing personalized regenerative medicine and accelerating drug discovery,” she said. Dr. Lee said the goal for her research is to provide an invaluable resource for assessing individual risk and e-cigarette toxicant exposure. Ultimately, she wants to develop evidence-based regulatory guidelines that inform and protect the entire population. Dr. Lee received a $1.1 million grant as a co-principal investigator from the Tobacco-Related Disease Research Program in April 2018 while she was at Stanford University and a $308,000 grant as a principal investigator from the American Heart Association in July 2016. At Stanford University, Dr. Lee identified biomarkers for assessing low-dose radiation risk in patients undergoing cardiac medical imaging, such as cardiac computed tomographic angiography and single-photon emission computed tomography myocardial perfusion imaging. She also was involved in several projects related to regenerative medicine and cardio protection. Dr. Lee received her bachelor of science degree in biomedical engineering from Yonsei University, South Korea. She attended Virginia Polytechnic Institute and State University, where she earned a master’s degree and completed her doctorate in biomedical engineering. Dr. Lee’s PhD work focused on investigating the molecular mechanisms of radiation-induced injury. After completion of her PhD, she pursued a postdoctoral fellowship at Stanford University in Cardiovascular Medicine and Radiology before becoming an instructor of cardiovascular medicine at the Stanford Cardiovascular Institute.